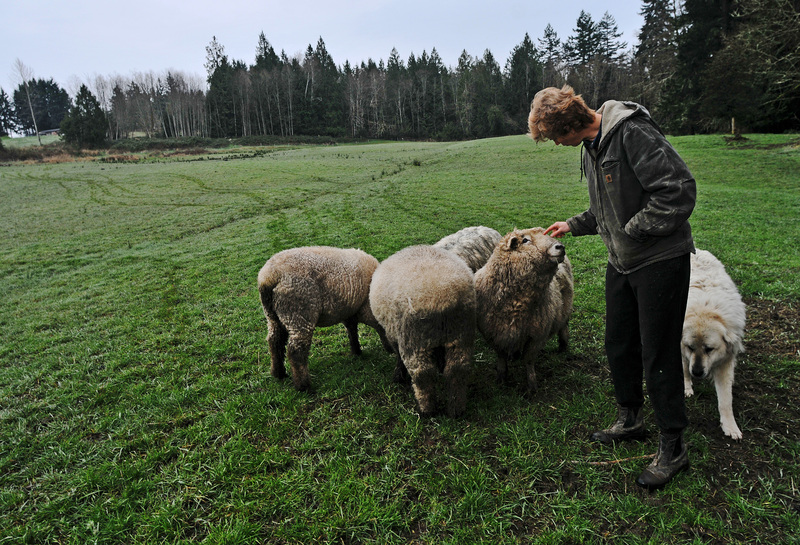 Janice Bryant checks the pasture where the rams are kept. The ewes and lamb are separated from the rams during lambing season. 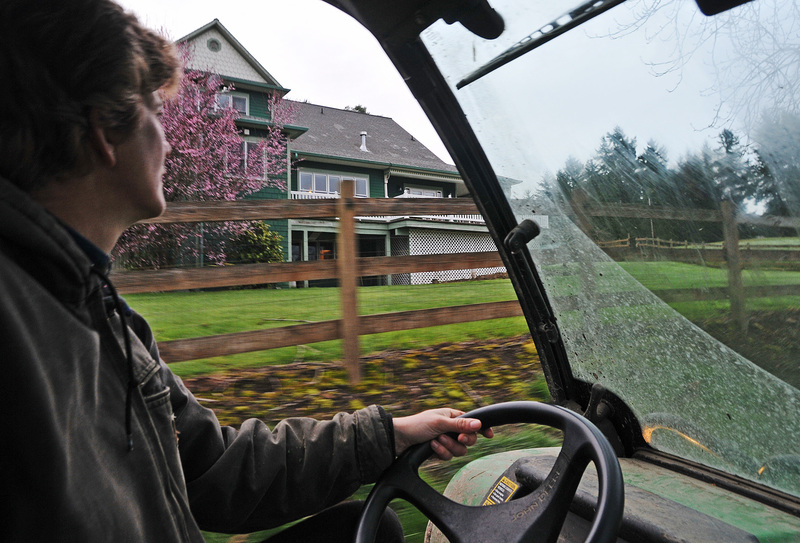 Janice Bryant’s day starts earlier than most people — waking up at 4 a.m., fixing a cup of tea and then off to the shed where Kaukiki Farm’s all-terrain vehicle is kept. Janice in one of the stalls where the newly-born lamb are kept. This is life on a farm and a choice for this family of four. 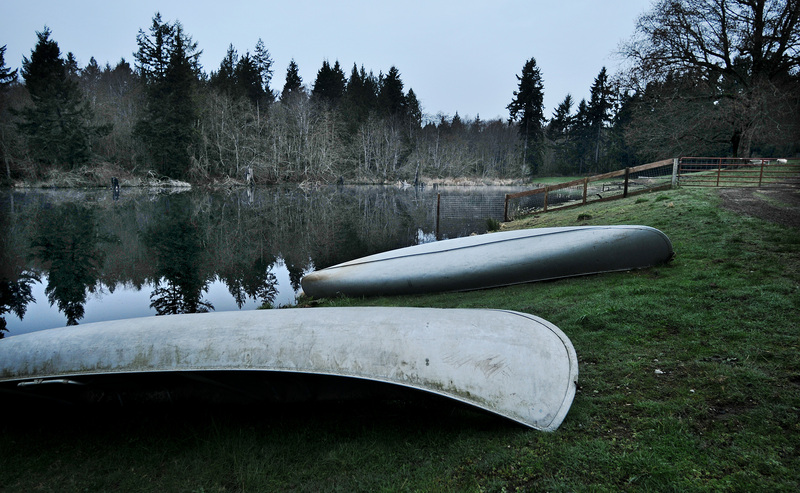 Bryant and her husband Warwick bought this 70-acre property along the Key Peninsula Highway in 2007 to give their two boys — Mac, 10 and Jackson, 8 — a childhood much like their own. Janice grew up on a farm in Glenwood, Iowa, and Warwick on his family’s sheep station near Taihape (pronounced tie-happy), New Zealand. Although Kaukiki Farm is a working farm, “we could never make a living doing what we do here,” he said. He owns a business building fences and Janice works at the Puget Sound Naval Shipyard as an electrical engineer. The farm is strictly a lifestyle choice. 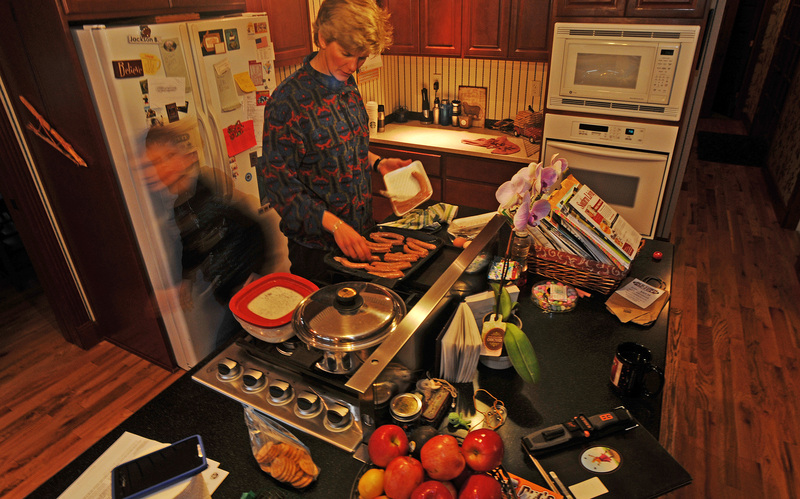 Jackson, 8, helping his mother with breakfast. Ultimately it is giving their boys the experience and education that only life on a farm can give them, he said. “It is for the kids,” Janice said, echoing her husband’s reason for buying the farm. As if on cue, Mac sticks his head through the kitchen door handing his mother an egg. He had just gone down to the chicken coop to collect the morning’s batch of eggs while his brother Jackson was helping with the pancake batter. Breakfast was sausage, pancakes, eggs and sliced strawberry. The sausage, Janice explains, is from their hogs Big Fatty and Little Pink. Everything on this farm “with the funny name” seem to get used. Kaukiki Farm is named after the tallest hill on the the farm Warwick Bryant grew up on near Taihape, New Zealand. She said it was her suggestion to call the farm Kaukiki. It is the name of the tallest hill on Warwick’s family farm in New Zealand. “I just wanted (Warwick) to have a piece of his legacy here,” she said. “To recapture a little of what he had” as a boy growing up on a farm in New Zealand. It is a legacy of hard work. 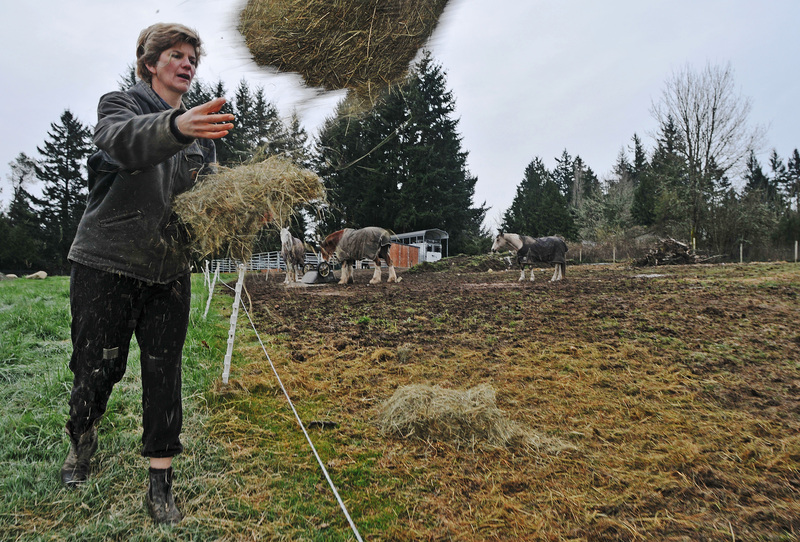 And on this farm on the Key Peninsula there are plenty of chores to do daily. Janice drives a John Deere Gator to get around the 70-acre property. Through heavy wooden doors, past the pen keeping the llama and lining the back wall are six stalls bedded with straw. This is where the ewes and newly born lamb are kept. 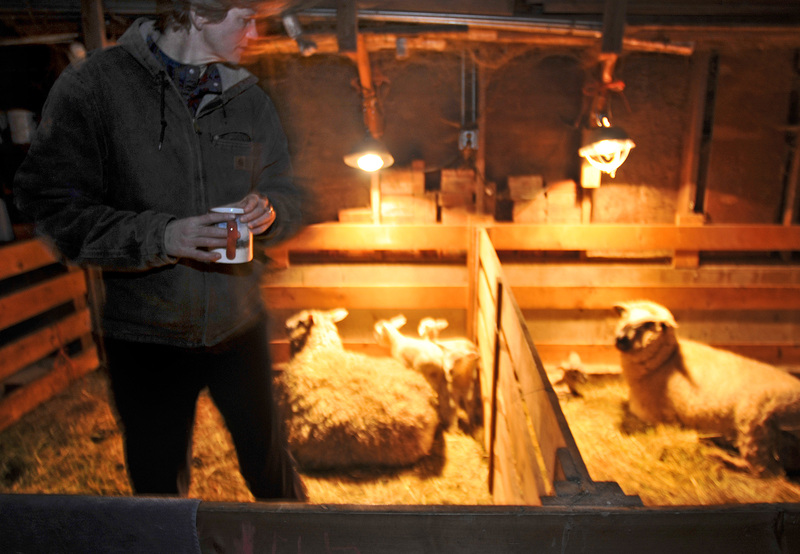 Under bright heat lamps, the lamb lie next to their mothers — singles, doubles and even the rare triplets. Janice talks about her animals as if talking about family. With her large Christmas mug of hot tea in one hand, Janice deftly moves around the dark barn checking on everyone inside. Kaukiki Farm has about 50 heads of sheep, and during lambing season that number can double. “See that lamb with black spots? We call that lamb-o-flage,” she said smiling. “It makes it harder for predators to spot them.” She explains that the lamb’s black fleece eventually turns white as they get older. Then it was time to walk outside and check on the ewes still waiting to deliver their lamb. Sheep mate in the fall, according to http://www.sheep101.com, so their young can be born in the spring — a process called lambing. The trick, Janice said, is to get the ewes pregnant in the fall at roughly the same time ensuring their lambs will arrive around the same period in the spring. 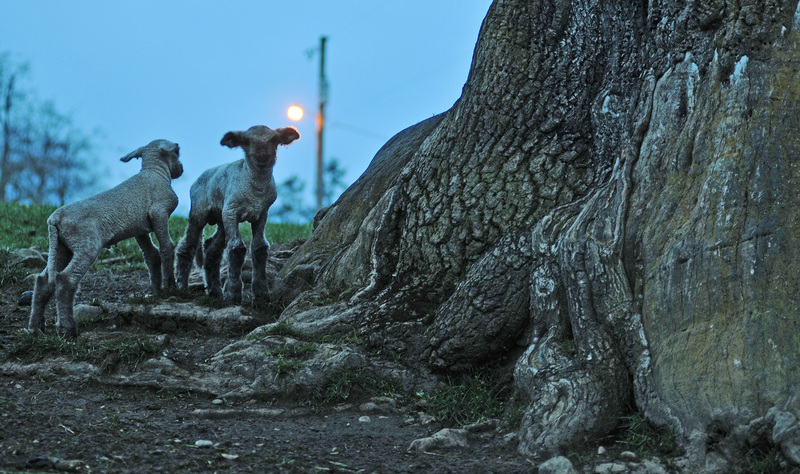 Lamb playing by a big tree at one of the pastures on the farm. This is where Jojo, the teaser ram, comes in. He struts around and gets the 36 ewes at Kaukiki Farm in heat, Janice said. Jojo is a sterile but good-looking ram and his only job is to get all the girls excited. 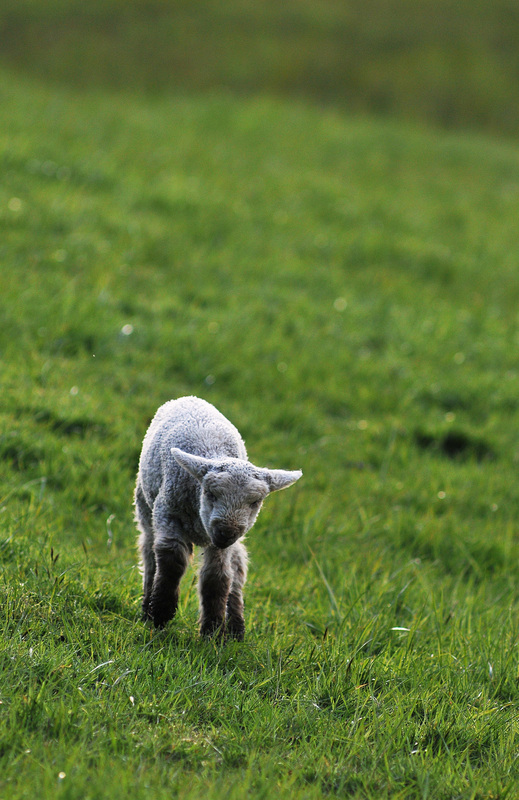 A lamb learning life on the green pastures of Kaukiki Farm. “He would walk around, stiffen one hind leg and curl up his upper lip,” she said. Apparently this drives all the ewes mad with passion. Enter Chunkamuffin, who is the stud of these pastures. According to Janice he has a big job: impregnating all 36 ewes while they are still in heat. 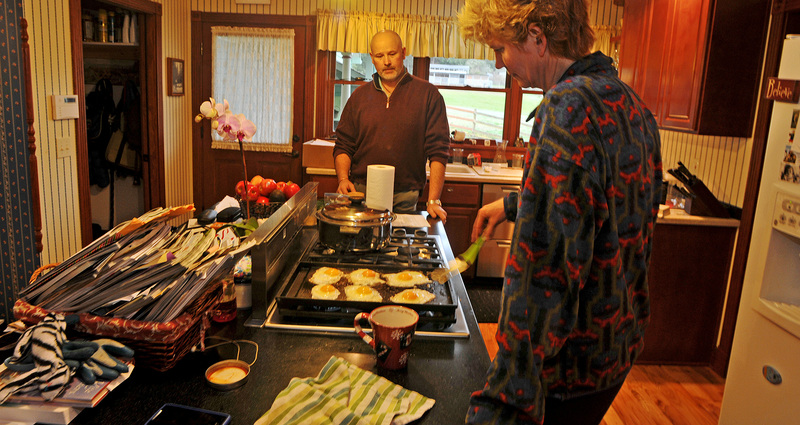 Kaukiki Farm includes a 4,200-square-foot farm house, right, that overlooks the property’s many pastures. 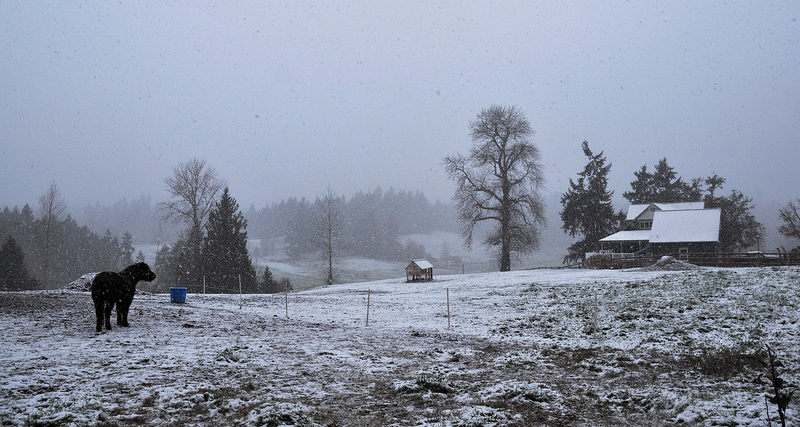 This photo was taken in January 2010 during the last big snowstorm on the Key Peninsula. A spring-fed pond at the back of the property makes for a beautiful playground for the “beer boys” — Mac and jack. Breakfast at the Bryants meant hearing what the boys were up to and a spirited discussion on the merits of sustainable farming. Thank you Melissa. I am looking forward to seeing your work and the cookbook. Very nice to have a peek into their life on the farm. I drive by many times a day with a bus load of kids (students) right now we have been looking for the lambs to get into the pasture by the road. I have been curious myself. The Bryants were gracious in inviting me to their lovely farm. I’ve always marveled at the sight of the ewes and lamb on the front pasture. Can’t wait to see them there. Thank you Dee.